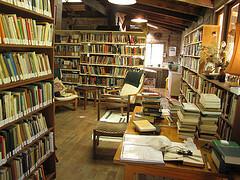 Home/noisy office/Should Your Office Environment Be More Like a Library? Should Your Office Environment Be More Like a Library? A ban on having private cell phone conversations where others can overhear! It’s easy to see how a library would make a decent model for a workplace where people actually get things done. That’s not to dismiss the coffee shop idea completely. A café would be a great atmosphere for a break room, training and orientation area, or even a conference room where people could chat and snack before getting back to work.